Think about all the time it took you to record all the tracks for your song. You spent countless hours setting up mics; getting good, “hot” (high, but not distorting) levels on your instruments; and making sure that each performance was as good as you could get it. You would think that most of your work is done. Well, on the one hand, it is — you no longer have to set up and play each instrument. On the other hand, you still have to fit together all the parts that you recorded. This process can take as long as it took you to record all the tracks in the first place. Your main tool during the mixing process is the mixer. The following illustration shows a basic mixer setup in a software mixer program. 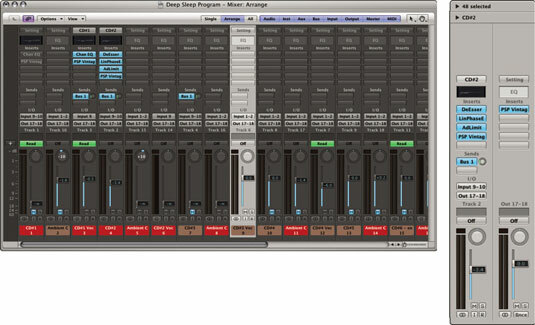 The screen shot on the left shows the main mixer menu — with faders for each of your tracks. The screen shot on the right shows the channel strip section of the mixer. Left: The main mixer menu in a software mixer. Right: The channel strip section of the mixer. Choose the recorded parts that add to the emotional impact of the music and build intensity throughout the song. Also, don’t use parts that are unnecessary or that clash with parts that have a greater impact. Set the levels (volume) of each of the instruments relative to one another so that nothing is buried so far back in the mix that you can’t hear it and no instrument is so loud that it overpowers the other instruments. Adjust the equalization (EQ — frequency response) of each instrument so that each leaves room for the other instruments in the mix. This means getting rid of any frequencies of an instrument that clash with another or adding certain frequencies that define the sound of that instrument so that it can be heard clearly in the mix. Take advantage of stereo panning to put each instrument in its proper place in the stereo field — left or right — where it can either sound as natural as possible or can produce an effect that you want. Also, stereo panning allows you to make room for each instrument in the mix, especially those that have similar frequency ranges. Add effects, such as reverb or delay, to the instruments in the mix to either place them in front or in back relative to other instruments or to create a desired sound. The mixing process is where you can get really creative in crafting your song. The stress of capturing great performances is over — you now have to massage all the parts of your song into a cohesive whole. Don’t be afraid to try new things. Experiment with different EQ, panning, and effect settings. Take your time and have fun. The great thing about mixing is that you can make as many versions as you want, and you can always go back and try again.